For motorcycle, ATV, power sports, and other small engine starting batteries. For vehicles used every day, the Battery Bug will constantly monitor battery performance, clearly indicate battery state of health and provide peace of mind that the battery is up to the task of reliably starting the vehicle. The BB-SBM12-PS uses CrankCheck technology to test the health of the battery every time the engine is started, tracks the decay of cranking health over time, and provides a 'replace battery' alert and audible alarm before the battery fails. The 6 foot long cables allow the display to be mounted outside the battery compartment. 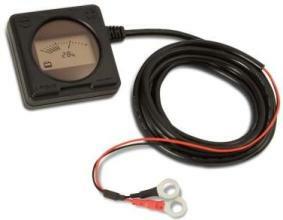 For motorcycles and or other powersports vehicles often stored for weeks or months at a time, the charge monitoring feature of the Battery Bug will significantly extend battery life and eliminate the need to continuously charge the battery. All batteries naturally lose charge slowly over time. A battery that remains discharged for any period of time permanently loses capacity. By constantly monitoring battery charge level, the BB-SBM12-PS will sound an alarm if the battery reaches a low state of charge, indicating the need to charge the battery immediately to avoid unnecessary battery decay. This feature prevents seldom used batteries from dying a silent death. The BB-SBM12-PS also includes an automatic volt meter function and displays battery voltage and alternator / charging voltage. If the battery charge level drops to a damaging level for more than one minute, a low battery alarm and icon will indicate the need to recharge.